Model car projects in Hobbies Weekly magazine. Hobbies Weekly model car projects. With television being far from widespread in the late 1940s and 1950s, hobbyists turned their hand to all manner of projects in their sheds and on kitchen tables to while away their spare time. Inspiration for projects could well have come from publications such as Hobbies Weekly, and on this page there are four issues featured, all with a model car theme to their covers. Priced at twopence, the earliest of the four dates to January 29th 1947, a time when new models and toys were still the preserve of the moderately well-off, another reason why so many people spent hours and hours hand-crafting their own substitutes. The cover features a neat illustration of a flying car, patterns for which are included within this issue. The other issues feature a self-propelled car, a child's pusharound "runabout", and a very neat-looking garage, on the August 2nd 1950 edition. To ease the process of building the models featured in Hobbies Weekly, a treadle-operated fret saw was available to buy, as was a larger version powered by an electric motor. An example of the former machine can be found in my own garage, although it has yet to run in anger. Mine probably dates to the 1930s, but earlier types were quite elaborate cast-iron affairs. The long-awaited "flying car" is now a reality. To prove it, and give our modelmakers something unique in the way of aircraft, we give details of a miniature, non-flying model in wood which is based on the car developed by the Southern Aircraft Division of Portable Products Inc, of America. The small, three-wheel, streamlined car seats two passengers. Propeller and wings are detachable so that the car can be used for ordinary journeys on the road. The actual outfit is still undergoing experimental tests and, at the moment, is not on the market. The model is a fair representation of the prototype and should create much interest when made, and exhibited. The illustration gives a good idea of the finished model. Instructions on how to go about constructing the model from wood then follow, coupled with diagrams, measurements and tips on crafting the required shapes all given. If this wasn't enough to keep the modeller quiet until the next issue of Hobbies Weekly, then a number of other project designs can also be found in this week's copy. How about building a match holder for instance, some novel picture frames from scraps of wood, or a standalone cupboard for the kitchen? Advice on how to create toys from discarded Vim tins is also given, ahead of the book reviews section. The self-propelled car illustrated and described in the April 6th 1949 copy looks like a jolly fun machine, perfect for terrorising the neighbour and their dogs or cats. Again it was mainly of wooden construction. Two levers operated by the arms provide propulsion, while the feet resting on the bar at the nose end of the vehicle, take care of direction changes. Certainly a lot more fun than the next design that a description can be found for, namely wooden trays. That doesn't sound like too much fun to me. More interesting though is the article on designing parts (eg condenser, a rack for the valves, and resistors) suitable for home-made radios. A little later than the Flying Car issue, adverts are definitely more numerous in this 1949 copy. One such advert, for Mastercraft Moulds of Hanwell in London, entices the reader to enter the business of making small models, from discarded lumps of lead - "small outlay - large profits" were the promise. Designs for a child's "runabout" star in the May 11th 1949 paper, which incidentally now commands a price of threepence. Designed to look similar to a Jeep, the suggestion made was to purchase a pre-assembled chassis from the publishers (another sign of creeping commercialisation perhaps), on to which you could fit your home-built coachwork. The main body was in wood, while the mudguards were to be cut from tin or zinc. No mention of sharp edges in those days either, other than for the fact that aesthetically they weren't terribly pleasing to the eye. If constructing a replica Jeep wasn't exciting enough, then perhaps pleasure could be gained by flicking ahead a few pages and studying a design for a model petrol bowser, or tanker. The content to be found in Hobbies Weekly is extremely varied, for instance the rear cover incorporates advertisements for Webley air pistols, Harris brushes, and Swiss-sourced postage stamps, while just one page before is an article on preserving flowers, and before that tips on assembling your own cricket wicket. Something for everyone indeed! The final copy shown at the top of this page dates to August 2nd 1950. Garages are the main subject for the week. 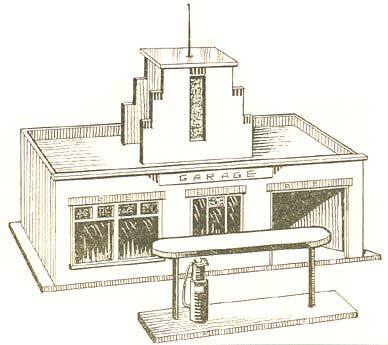 The cover shows the end result of completing a design for a modern garage, instructions for which can be found on the cover's reverse side. Perfect for displaying a collection of Dinky or Crescent toy cars, all it needs are some period signs for Esso Extra, and Redex. Overall it measured 18 inches wide. If building such a thing was all a little too juvenile for the older reader, then salvation could be found on page 283, where the final instalment of a "build your own garage" article resided, this chapter describing how window frames can be fashioned, and the roof assembled. I wonder how many have-a-go DIYers got part way through the project, then somehow missed a copy, and were left with a part-built garage? Logic says collect all the instalments prior to commencing the build, but I'm sure not everyone was so organised. I wonder what became of The Southern Aircraft Division Portable Products Inc's plans for a flying car? 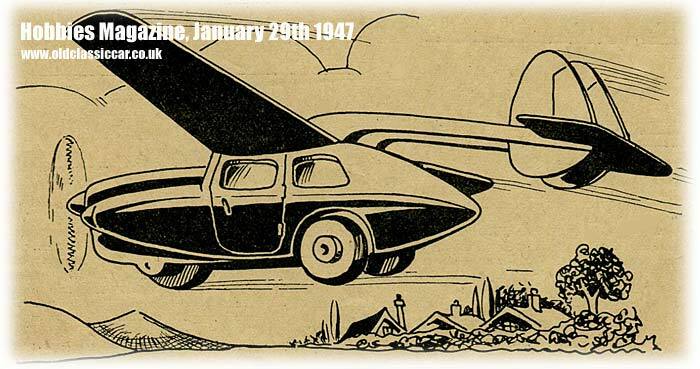 They weren't the only ones to have such grand ideas for personal mobility after WW2, details of one rival design - known as the ConvairCar - can be found on this page of the site. To read more about vintage toy cars and models, please visit the main toy cars page.